Join us for a fun evening supporting local cancer research! ​Silent & Live Auctions and Raffles! ​Seating is limited, get your table or tickets today! Sponsors make this event happen! Join us as a sponsor and receive recognition in event advertising, a banner displayed at the event and a Reserved Table for 10. Tickets for table will be at "Will Call" the night of the event. Please contact the office at (573) 875-2255 to make arrangements for name on sponsorship and company logos. See you soon! As vineyard VIP's you and nine of your friends will be treated to spectacular bluff-top views ans a private tasting and tour for 10 people at Les Bourgeois Yineyards. Cheers! Make quick work of large projects with this weekend rental (Friday-Monday) of a Bobcat loader or excavator! Includes 12 hours use of the power unit (650, E55 or smaller) and one bucket. All standard rental guidelines apply and machine is subject to availability. Customer is responsible for hauling with appropriate trailer and 3/4 ton pickup. Is there a room in your home that needs a facelift? Fix holes, mend furniture bruises and roll out a new paint color with this package of a $300 Gift Certificate toward drywall repairs or replacement, one hour in-home (evening only) color consultation with Lisa Medley, 2 gallons of Ben Premium Interior Benjamin Moore paint and painting of one interior room (walls only) by Chuck Turner. Donated by: Quality Drywall Construction - Mike & Connie Leipard, Lisa Medley, Johnston Paint & Decorating and Chuck Turner. Four premium tickets and a Diamond Preferred Parking Pass (Star Lot) to the Cardinals vs. Pirates game at Busch Stadium, Saturday, May 11, 2019 at 2:15pm in Section 140, Row E, Seats 5-8. Was winter mean to your driveway? Did spring bring drainage or landscaping projects? Sounds like you could use a load of gravel! Delivered to the lucky high bidder within a 25 mile radius of Columbia by Randy Ott. A classic near and far this little piggie needs no introduction! Cured and ready to be part of your favorite recipe or enjoyed all by itself. As durable as it is adorable, this all metal KUBOTA pedal tractor is sure to delight for generations to come! Make your rounds of some of the area's finest courses. Package includes: one round of golf for four with cart at the Country Club of Missouri, one weekday round of golf for four with cart at The Club at Old Hawthorne and one round of golf for four at the Columbia Country Club. Add this STIHL to your tool shed and make quick work of garden prep this spring! Includes a quart of STIHL Moto Mix Fuel to get your projects fired up right. Warmed by the setting sun and nestled in the Missouri River Bottoms surrounded by bluffs, bean fields and a winding road stands a grand bur oak. This majestic tree is located near Eagle Bluffs Conservation Area in McBaine, Missouri and is estimated to be 300-400 years old. Original photograph by Alycia McGee. Four premium tickets and a Reserved Parking Permit to Game 22 the Royals vs the Philadelphia Philies at Kauffman Stadium Sunday, May 12, 2019 at 1:15pm in Section 221 (Dugout Plaza), Row HH, Seats 7-10. On a clear day one can see Cape Elizabeth, Boston and Mount Washington from a lookout point alongside this beautiful barn that rests on the summit of Mount Agamenticus near York, Maine. Capturing the barn in its winter splendor, this original photograph by Penny Lattin is uniquely presented on wood and ready for hanging. Four premium tickets and a Reserved Parking Permit to Game 34 Royals vs Chicago White Socks at Kauffman Stadium on Sunday, June 9, 2019 at 1:15pm in Section 125 (Dugout Box), Row P, Seats 5-8. From movies to game day to the kid's cartoons, everyone gets an upgrade with the stunning picture quality of this 50" LG 4K Smart TV! Billed as “The Rifle That Brings Out The West In You” this made in America or not made at all lever action repeating .22 rifle is sure to be a favorite now and for generations to come! Built to last with a 20in blued octagonal barrel, American walnut stock, brass buttplate and gleaming brasslite receiver. Weekend at the Kansas Speedway! Take your pick of two weekend race packages at the Kansas Speedway! Each race experience includes two tickets to two NASCAR races, one night’s stay at the 21c Museum Hotel Kansas City (room w/two queen beds) and two Sprint Track Passes. For the May 11th and October 19th race enjoy infield activities with your Pre-Race Track Pass including: viewing the NASCAR inspection area, driver introductions, pre-race concert and the opportunity to sigh the start/finish line and crash walls. Two Friday, May 10th NASCAR Gander Outdoors 250 race tickets, one night stay at the 21c Museum Hotel Kansas City & two Saturday, May 11th Monster Energy NASCAR Cup Series race tickets with two Pre-Race Track Passes. Two Saturday, October 19th NASCAR Xfinity Series Kansas Lottery 300 tickets, one night stay at the 21c Museum Hotel Kansas City & two Sunday, October 20th Monster Energy NASCAR Cup Series Hollywood Casino 400 tickets with two Pre-Race Track Passes. If you ask Henry no rifle has put more antlers on the wall or venison in the freezer than the .30/30. So it’s no surprise that the latest addition to their line of storied 100% made in America lever-action repeaters is this 20” octagon barrel, brass receiver and American walnut .30/30. Both lightweight and maneuverable at 39” long, the H009B is right at home in dense timber and heavy brush. Drilled and tapped for easy scope mounting. Take home your new deer hunting buddy today! An opportunity of a lifetime! 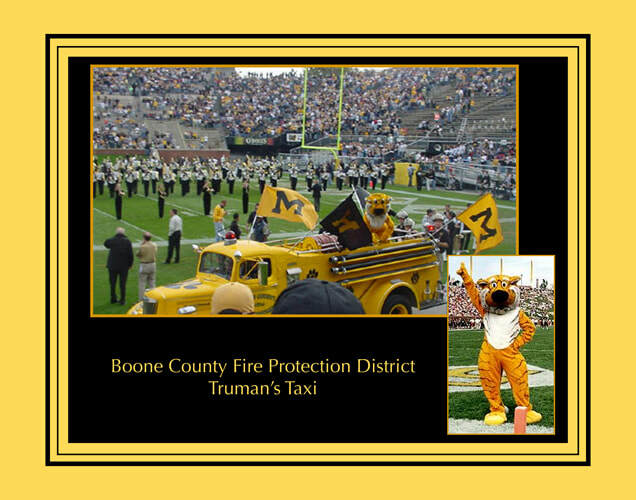 Your child or grandchild (12 years of age or younger, up to 2 children) will circle Faurot Field with Truman the Tiger on “Truman’s Taxi” the Old Yellow Fire Truck while operating the siren during pre-game activities at a University of Missouri-Columbia home football game. Valid for the 2019 Season. Very limited opportunity, winner please schedule for chosen home game ASAP. What do you get when you take the power and features of a full sized M&P pistol and put it in a slim, lightweight package the size of your hand? The M&P Shield! Reliable operation and professional grade features make the M&P Shield 2.0 9mm a go to among concealed carriers. One million Shield owners can't be wrong!